Whether you’re Sting, Jean-Michelle Basquiat or Sergio Leone, sometimes you need to return to your roots for inspiration. Often it is in these decisions that true artists find the vision for their most celebrated work. And some are already saying you can add Rosio Sanchez to that list. After resigning as head pastry chef at the world-famous Noma back in 2015, Sanchez embarked on her fist solo venture, opening a taco stand in the heart of Copenhagen. She was following what she describes as a “craving” to recreate the authentic Mexican food of her home on the south side of Chicago. Just like her daring counterparts, there is plenty of risk and reward to be had. Although Copenhagen is famed for its culinary prowess, like most of Europe it seems to have completely missed the taco craze of the last decade that swept through the United States. Luckily, Sanchez is stepping up to the plate to bridge that gap with her authentic Mexican taquerias. 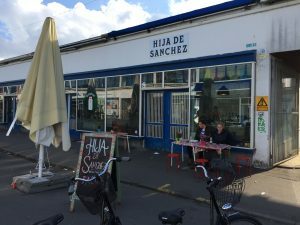 With rich ingredients from the Mexican heartland and her ever tenacious, inventive attitude, Hija de Sanchez is dishing up fantastic lunchtime options. The Vesterbro location – a small storefront tucked into a maze of outlets that make up the meatpacking district – is perfect for a lazy afternoon spent at its outside seating in good weather, people-watching and taking in the atmosphere of one of Copenhagen’s trendiest area. Most of the customers opt for takeout, which is just as well as it can quickly become crowded if more than five customers are in the restaurant at once, as seating and standing room is limited, even if the view of the white tile kitchen is charming. Then again Crowdedness is, in the eye of the holder, and very possibly dependent on our cultural background, and where some observe discomfort and claustrophobia, others see cosiness and closeness. Regulars will quickly learn that Sanchez will never rest on her laurels. Taking a note from her former experiences at Noma, she is always finding new and inventive ways to ‘spice up’ her ever-changing menu. Many of the dishes are remembered from her childhood, although the ceaselessly imaginative chef never shies away from breaking the mould and pushing the boundaries on what some would consider to be a bulletproof formula. On the day I stopped by sunny Vesterbro, there was a mix of pork, chicken, and vegetarian options. 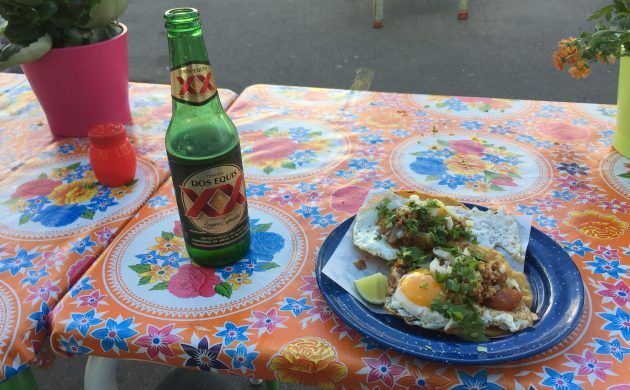 I opted for the latter, a fried egg taco layered with avocado, cilantro and red onion, served on a crispy shell, and took my plastic plate adorned with smiling suns out into the real thing. Sanchez has achieved something that I believe is incredibly rare at most restaurants or at least at establishments with such an affordable price range. Paying just 74 kroner for a slice of somebody’s childhood seems like a pretty fair trade to me. 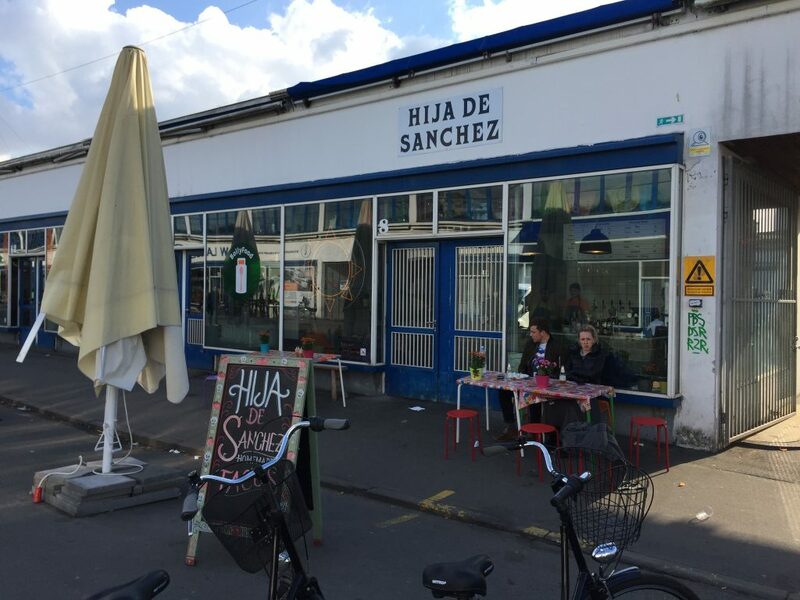 Whether it’s taking out or dining in, Hija De Sanchez can’t help but leave you satisfied.